Indians outraged at an attack on women for drinking in a bar have gathered together to send a provocative gift of underwear to right-wing activists. More than 5,000 people, including men, have joined the Facebook group, which calls itself the Consortium of Pub-going, Loose and Forward Women. 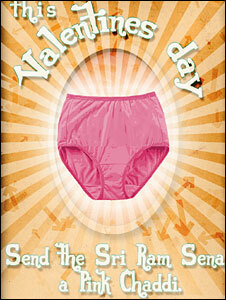 The group says it will give the pink underwear to Sri Ram Sena (Army of Lord Ram) on Valentine's Day on Saturday. 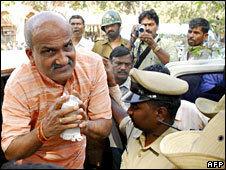 It was blamed for the bar attack in the southern city of Mangalore last month. Pramod Mutalik, who heads the little known Ram Sena and is now on bail after he was held following the attack, has said it is "not acceptable" for women to go to bars in India. He has also said his men will protest against Valentine's Day on Saturday. The Consortium of Pub-going, Loose and Forward Women, which was formed on Facebook last Thursday, has also exhorted women to "walk to the nearest pub and buy a drink" on Valentine's Day. A spokeswoman for the group, Nisha Susan, told the BBC it was giving chaddis (Hindi colloquial for underwear) as they alluded to a prominent Hindu right-wing group whose khaki-shorts-wearing cadres were often derisively called "chaddi wallahs" (chaddi wearers). "We chose the colour pink because it is a frivolous colour," she said. Ms Susan said the group expected to collect at least 500 pieces of pink underwear from all over the country and send them to Mr Mutalik's office in the southern city of Hubli. "It's a choice between ignoring a group like Ram Sena or responding to its activities. We have decided to give it attention, but it is attention which it will not like," she said. The group has asked people to mail or drop underwear at "collection points" across the country. The Ram Sena has not yet commented on the group's moves. Last month's attack in Mangalore, which was filmed and then broadcast on national television, shocked many Indians. Television pictures showed men chasing and beating up the panicking women. Some of the women, who tripped and fell, were kicked by the men. Around 30 people, including Mr Mutalik, were later arrested. Women's groups strongly condemned the attack, which was described by the country's Women's Minister Renuka Chaudhury as an attempt to impose Taleban-style values. The Hindu nationalist BJP government in Karnataka state distanced itself from the attack. It said it had nothing to do with Sri Ram Sena. But a BBC correspondent says that right-wing Hindu vigilante groups loosely linked to the BJP are active in many parts of India and have in the past targeted Muslim and Christian minorities as well as events such as Valentine's Day.